Its no secret that I love easy lunchbox items. Daily morning I spend some time thinking about what to cook. This is one such item that I tried recently. I had seen this recipe in one of the TV shows back home. This rice takes some time to get used to. While I simply love this, V is not a great fan. I would definitely recommend trying it atleast once. Cook the rice taking care the grains are separate. Dry roast sesame seeds, coriander seeds, urad dal and red chilies(take care not to burn anything. You can roast them one by one if needed). Grind them to a powder along with coconut. Heat oil and add mustard seeds. When they start popping, add curry leaves, asafoetida and cashews. Fry for few minutes on a low flame. Now add the spice powder and salt. Add rice and mix well. Finally sprinkle the lemon juice and take off heat. I love easy recipes too. This sounds good. Love anything with cashews and anything with rice. This looks delicious! looks nice and interesting also, will try it out soon, happy janmashtami to you. This looked awesome when i first saw it & when… I thought of trying it as today was a sunday & its typhoon in Hong Kong….It became delicious…..reminded me of good old goa times….thanks a lot…. 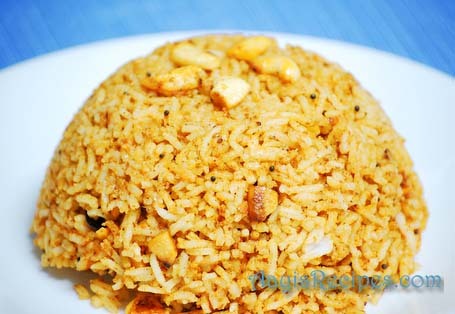 cashew rice looks rich and tasty.. must taste good. The colour alone is inviting. This is a nice recipe.. thank you.. The pic looks inviting too..
Oh,Wanted to write to you sometime ago to ask if I could add your site in my favourite blog list.. Awesome. I prepared this for the lunchbox; for both myself and my husband. he liked it very much. Tried this recipe. It turned out yummy. It will be on my list of comfort food henceforth. Thanks. I have been following your page for some time now – quite interesting on the whole. Just wondered if you wanted to post a Chavati special! I tried this cashew anna….it was very tasty re….thanks a lot for posting such a nice rice item…..instead of rice i used avallaki ( phovu) and offered as prasadam re….. I like the many textures and flavors in this rice. It sounds really tasty and you did a lovely job with the presentation. We would like to feature this recipe on our blog and possibly our digital recipe reader. Please email me at sophiekiblogger@gmail.com if you’re interested :). Have a lovely evening. Good to see many varieties of lunch items.My mouth is watering.I remembered one rice item which my friend Sudha used to prepare.She used to call it Variety rice.I want to share that recipe. Cook rice separately and see to that the grains are separate. Make a paste of coriander,mint and green chillies. Take a kadai and add some ghee in it.Put it on a low flame.Add udad dal,mustard seeds,chana dal to it.Fry it. Add curry leaves,cashew nuts and ground nuts to it.Once they are slightly brown ,add the paste and fry it a little.Add salt to it. Fry it for a while then add this to the rice and mix it properly. This tastes well with raita or yoghurt based tomato chutney. wow, sounds good and simple…. Oh shilpa, this rice i made today for lunch. its super awesome. I love the taste of coriander and sesame when i put the rice in my mouth. lovely! thanks again. :)god bless. This recipe was fabulous. I just prepared this for dinner and it came out great. Love this dish!! Hey Shilpa, I tried this with brown rice. I thought it would not come out great. It still turned out superb. Thanks for the recipe. Wow, that is good to know. Thanks Kavita.